December 7, 2018 December 7, 2018 admin Comments are off. Excellent value for money, the Intuitive Series of high performance digital panel meters are easy to use, highly reliable and accurate, with a 3 year warranty. 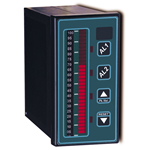 A new setup system in the INT4 series makes these panel meters super-easy to set up, saving you time and money. They can be set to display 2,3,4,5 or 6 digits and have a wide range of plug-in output options to give useful control, recording and communications capabilities. They accept most industrial sensors and signals, allowing you to use one familiar range of products for many applications. All are RoHS compliant. 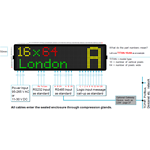 We can make stand-alone andon displays or can include them in more complex displays along with large digit numeric displays or text displays, with sounders, email and SMS notification. 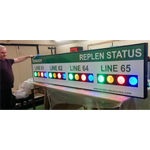 An andon is literally a beacon – in its simplest form it can be a single LED which can be lit to indicate the state of something in your process. The Fusion series of Large displays let you clearly see important information from a distance. We make large displays which accept most industrial signals such as Ethernet/IP, Profinet, Profibus, Interbus, EtherCAT, ControlNet, T24, 4-20mA, 0-10V, Load Cells, RS232, RS485, Modbus, TCP/IP, Thermocouples, PT100, Humidity, NPN, PNP and also make large digit clocks, timers and counters. All displays are RoHS compliant. 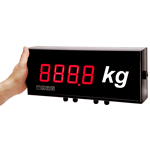 Bargraph and Ribbon displays are ideal for showing relative amounts, such as level, temperature, weight, pressure etc. They give a quick idea of how hot, heavy, full etc. something is. 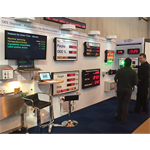 With these industrial message displays you can share important production and plant information with all your team. Information which is up to date and easy to see is vital for efficient teamwork. 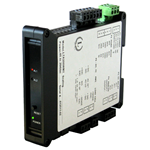 They are easy to integrate into a wide range of industrial fieldbus networks and we can provide pre-configured gsd files for most formats. Most of our products can provide data for archiving in a cloud-based database. You can access this data from wherever you are, and analyse KPI trends which are important to your process. You don’t need any special software to view the reports, just a web browser. All the analysis packages we do are customised for you, to make your reports focus on the most important data automatically, such as OEE, reasons for down time, Takt time, quality, scrappage ratio etc. All information contained on this site subject to Australian Copyright laws © AMS Instrumentation & Calibration.